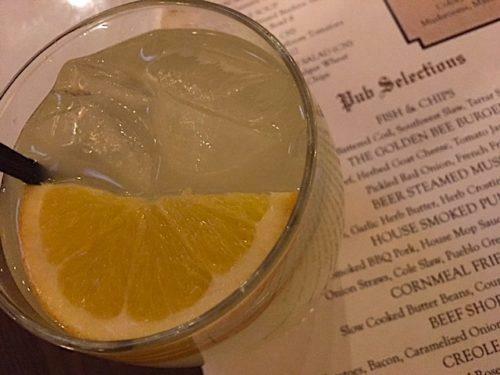 The Golden Bee at The Broadmoor in Colorado Springs, Colorado, has been held in high regard as a traditional British pub for decades but in November 2017 the menu was finally the recipient of a long-overdue and Americanized face-lift. John Johnstone, vice president of food and beverage, and David Patterson, executive chef at The Broadmoor, came to the conclusion that the concept of a “classic” pub is intangible at this juncture and that true English cuisine is the victim of unsettling misrepresentations. Instead the Golden Bee invites inherent Southern flavors and a regional perspective with the foundation of a solid Colorado gastropub. In the past, the Golden Bee’s operation was a realistic portrayal of a simple British pub and housed only 50 seats total. However, a massive reconstruction project five years ago built out the front room and terrace attracting more guests who see the space as a dining venue versus just a local watering hole. A sweet and sour Laphroaig whisky cocktail holds down the new Golden Bee menu. As the diversity in Great Britain dramatically shifts more and more towards a multi-cultural conglomerate we notice more ethnic foods push to the forefront of English cuisine. Going forward that begs the question: What is proper pub fare nowadays? The popular Indian entree, chicken tikka masala has a firm foothold with the pronunciation as a national dish. “We’re supposed to be this classic English pub but nobody even knows what that means,” urges Patterson. There is a distinct effort now at the Bee to rank amongst more casual bars with a diverse range of options that only nods slightly here and there to the origins of the Anglo-Saxon roots. The strong presence of Southern flare can trace back to Patterson’s upbringing in Louisville, Kentucky, and consistent childhood visits to Tennessee. Nashville hot chicken wings are engrained “in my DNA,” says Patterson, and the spicy starter tops the list with scrumptious, crunchy breading and noteworthy heat. RMFR dines and unwinds with chef Patterson over a yard of beer at the Golden Bee and we immediately lose the inclination that a pub must be married to the way things have always been. 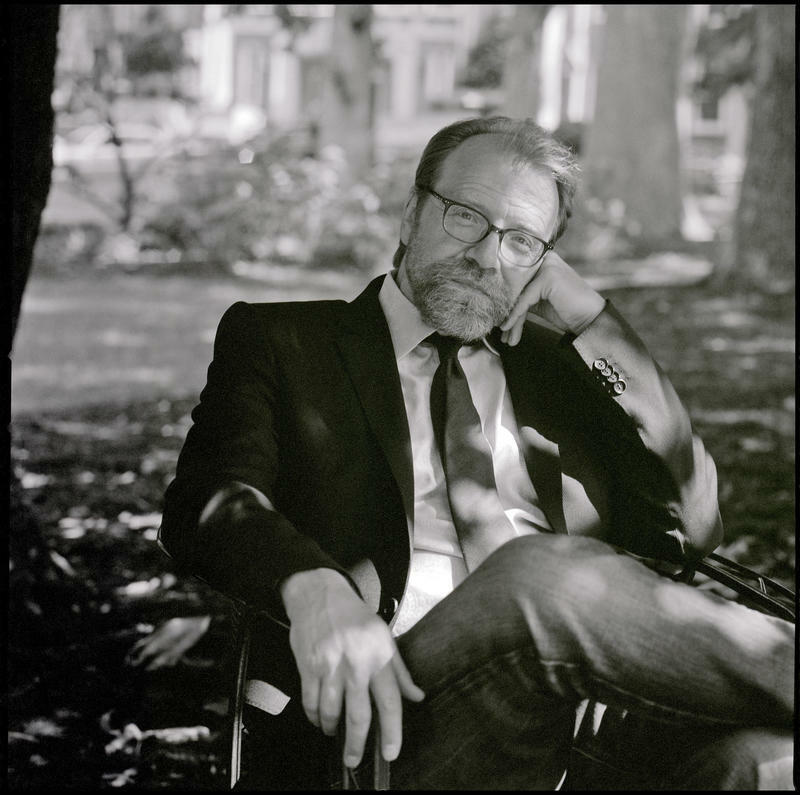 We experience a moment of Deja vu as we recall the very same sentiment echoing in our initial Q&A with Johnstone that was conducted shortly after his arrival at The Broadmoor in spring of 2016. The table begins to fill up with a variety of appetizers and entrees that invites all of the eclectic elements. We proceed with more sharables as a pseudo, mini fry basket props up fried pickle spears and pretzel rods stand in a dimpled copper cup with a side of pepper jack fondue. 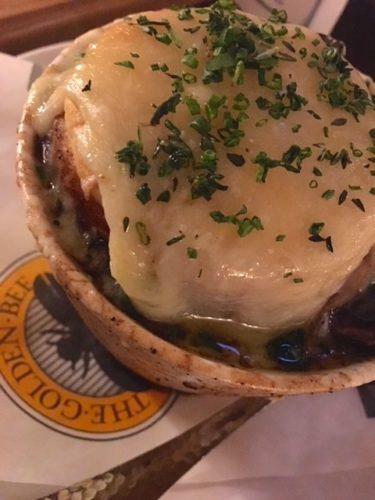 For dinner, we continue the family-style methods and try the beef short rib pot pie that arrives in a soup cup full of savory sweet potatoes, caramelized onions and bacon covered by a roof of drop biscuits and cheese. The Tuesday special arranges for a large, bright Nicoise salad with slices of seared tuna, fingerling potatoes and crisp vegetables tossed in a light red wine vinaigrette. To further explore the Southern tier we opt for Creole shrimp and grits with large prawns in a fragrant, peppery rosemary sauce that arc over the edges of a sourdough bread bowl. We go for legitimately down-home cooking with a generous portion and casual presentation of pulled pork complete with Texas toast, Pueblo green chili relish, sweet barbecue sauce, slaw, French fries and onion straws. A satisfying short beef rib pot pie doesn’t last long on the table. 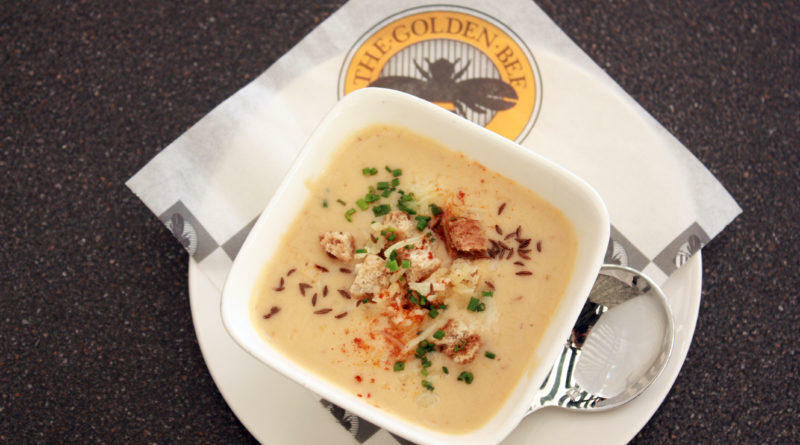 The Golden Bee maintains a few English favorites in an attempt to bridge the gap for old-school fans with weekend appearances of bangers and mash and shepherd’s pie. Old habits dissolve from the inside out with Roland Lacroix, executive chef at the Golden Bee, (and veteran chef at The Broadmoor with three-year’s experience as a part of their banquet team) who fully welcomes and embraces the paradigm shift. We conclude the meal with a trio of English-inspired desserts. A sticky toffee pudding that consists of a moist date cake suspended in a rich toffee sauce with a pillow of Drambuie whipped cream and mint garish. A slice of Bakewell tart maintains a shortbread-style crust, almonds and authentic Devonshire cream but receives a modern upgrade with juicy strawberry marmalade. Our favorite is the luscious, miniature banoffee pie with dark chocolate shavings that tastes like an East coast boardwalk treat, a chocolate covered banana with the addition of caramelized milk and graham crackers. The changes at the Bee haven’t come without ample push back from longtime patrons but Patterson adheres to the fact that years of stillness invokes an “obligation to reinvent and revitalize.” We can attest that the updates are not only warranted but absolutely necessary to continue to thrive on the five-star lot and stay relevant in the Springs’ continuous culinary evolution. 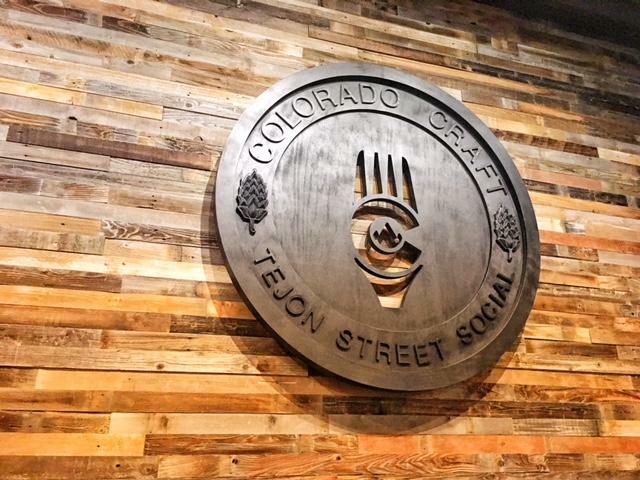 Colorado Craft Tejon Street Social is quite a mouthful, but the terminology encompasses all of the elements that the ownership aspire to be when doors open on Monday, January 22. Colorado Craft held a private media tasting prior to launching their soft openings to unveil the updated space, a round menu and to discuss the concept and origination behind the nomenclature.